Not really coding, but still an engaging electronic puzzle that responds to the sequence of given commands. Joining the segments to the motorized head via USB connections, children create a sequence of commands that the Code-a-pillar will follow once activated. Each segment has a different command, making the toy move forward, turn corners, and make music depending on the order the commands were placed. When we heard about a toy that teaches kids how to code, we were skeptical. As with many other toys that are promoted as “educational,” this claim that a toddler will learn coding basics is a real stretch. However, like all puzzles and toys that challenge cause-and-effect and problem solving skills, this toy can help excite and ignite the core skills needed for critical thinking throughout their life. If you want more toys that help with the foundational critical thinking skills needed for future problem solving, check out our STEM Toys Roundup. The Code-a-pillar is made by linking command segments to the motorized head. Each segment has a single command, such as turn left, turn right, go straight, or play music. The head lights up while the enclosed motor powers the toy forward according to the commands given. Changing the sequence of the segments changes the order the commands are followed in, making it a kind of sequential puzzle to get the toy to crawl to a target location. Batteries come included, but are only meant for the demo and will die quickly. Be sure to purchase additional batteries. Includes one motorized head with eight segments (three go-straights, two right turns, two left turns, and one sound effects segment). Turns are 90 degrees. Two destination targets are also included. Connect the segments to the head to create a sequence of commands that the Code-a-pillar will follow. Once comfortable with the basics, try setting up pathways and obstacles made of blocks and other toys. We enjoyed using masking and painter’s tape to make a pathway on the wooden floor and took turns seeing who could get the toy the stay within the lines. Getting positive feedback from users, this toy’s lights, music, and movement often captures the attention of small children and toddlers, while the challenge of creating command combinations appeals to older children. 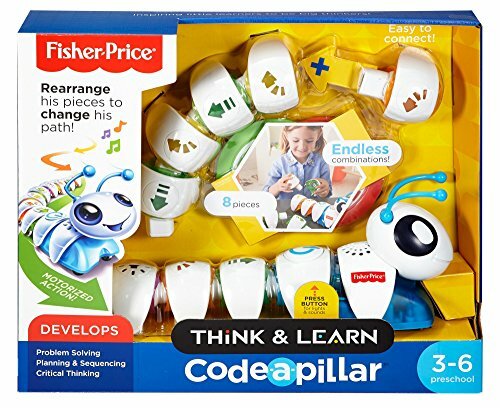 Will this teach a child coding? Not even a little. Skills in problem solving, sequential thinking, and patience can be improved, which are certainly useful in learning to code, but no, it will not teach the actual practice of writing code. It’s being targeted to young children, after all. With that said, the toy is enjoyable for kids, and is often requested for playtime multiple times a week if not daily, though for less than an hour at a time. Children as young as 15 months may enjoy this toy. Children under the age of 2 will likely be drawn to the sounds, lights, and movement, and will begin to explore the command combinations as they get older. Typically, children around the age of 4 are challenging themselves with trying to make the toy go along an intended path, while children around the age of 6 may have more competitive play as they see who can make the toy move to a certain spot with the fewest moves. This is by far the loudest caterpillar we’ve ever encountered. Lacking any kind of volume control, the sounds and music have been reported as annoying by many users, though they also said it doesn’t stop them from letting kids play with it. We found it runs best on hard floors, such as wood or concrete. It worked okay on really short pile carpet and thin rugs, but got bogged down on thick pile and plush carpet, and rugs with particularly cushy pads under them. While it may be able to move around on carpet, we worry that it adds extra stress to the motor that may make it burn out quicker over time. In addition to a hard(ish) surface, it needs a fair amount of space to maneuver. It may be able to go a little ways, but running into a wall will make it stop. Once this happens, it needs to be repositioned and restarted from the beginning of the command set, as there is no way to pause the commands. Picking it up also stops it, so curious siblings and dogs may have to be shooed away from time to time. Using 4 AA batteries, each new set of batteries will last for approximately 10 hours of playtime. We suggest using rechargeable batteries for this toy, as they will likely save money and landfill space over the long run. We’re a little surprised that there is no option for plugging into the wall and charging the toy, as it seems that most current electronics use this method for power instead of batteries. Segments use USB connections, which may prove a little tricky for children to properly link up, at least at first. We recommend adult supervision while kids are learning how to connect the segments so that nothing gets bent or warped out of shape. Expansion packs are available for a reasonable price, and add more commands. We don’t think that children under 4 need these packs since they are still learning the combinations needed to make the toy move in a certain way. However, older children, around 6 or so, may appreciate having more options to play with. There’s an app that can be used with it, though it’s not required for play. It includes counting games and some challenges that require plugging in the correct sequence of movement commands. The End User Agreement must be accepted to download the app. Expansion packs can be purchased to increase the number and types of movement commands that can be used. We aren’t buying it that this toy will teach a child anything about coding. It challenges cause-and-effect, problem solving, sequential and critical thinking skills, but so do non-electronic puzzles and logic games. In short, enjoy this toy for its fun factor, and think of it as a responsive puzzle.